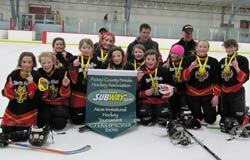 CHAMPIONSHIP WINNERS - PICTOU COUNTY ATOM GIRLS TOURNAMENT!!!!!! Congratulations on an exciting end to the Pictou weekend! All of the girls worked extremely hard game-by-game, complete with the big third period line switch from defence to forward (Syd set up a few surprises!). It was great hockey all around...every girl played very well!!! Congratulations to Kellyn, Sydney, Danielle, and Tait on receiving Players of the Game Awards! The hospitality was fantastic (Yarmouth created a fantastic NR cheerleading section with their puppets, Pictou put on a spread of food that filled everyone to the brim, and people were friendly , friendly, friendly!). Fun, fun, fun in the pool and on the waterslide (when a certain Mr C wasnt butting in front of the line:) Great memories all around! Congratulations girls...on 3 wins to guarantee a spot in tomorrows Championship game! Way to play! Good luck tomorrow! Reminder: Bus to O'Leary Cancelled and Panther Game is ON! Just a reminder that the bus trip to O'Leary is cancelled for today. The girls are to wear their white jerseys to tomorrow night's Panther game and meet in the Cari lobby at 6:45. One parent will be admitted free along with their player. Girls will head down to the dressingroom after the game and can bring any item plus a sharpie to get autographs. Crossover game tomorrow at 10:30 in Belfast vs Dartmouth....get plenty of rest, and pre-game protein! NR2 is playing immediately after our game vs Morell! Good luck NR1 & NR2 girls!!!!!!!!! REMINDER ~ TEAM PICS MONDAY!!! Reminder to wear your white jerseys and socks to Monday's practice for team and individual pics! Please be dressed and ready by 3:50. CONGRATULATIONS ALYSSA VANDUINKERKEN ~ API PLAYER OF THE MONTH!!! Alyssa was selected as one of API's Players of the Month!!!! - API Hockey PROS "The Heart" trophy. - API Hockey PROS cap. - API Hockey PROS water bottle. - API Hockey PROS mini stick. - $5 store or Free skate sharpening coupon. - 8 picture player cards with his/her team jersey. One for the wall of fame in shop. One for API Hockey PROS player of the month feature on NRMHA's website. To read the coaches nomination statement, please go to our archived news page! "Alyssa is a first year player with our team. She tries to do whatever she is asked in practice and she works hard. She exhibits some small smiles during hockey but saves her best for the 'high fives' after goals (no matter who scores). She is a pleasure to have on our team. She is eager to learn and with her willing attitude, she would be a benefit to whatever team she is on. BUT SORRY TO ALL THE OTHER TEAMS. SHE'S ON OUR TEAM THIS YEAR AND WE AREN'T TRADING." This entry has been submitted by Lowell Stevenson on behalf of the NR 1 coaches. Reminder: Christmas Party with NR2 after the game Friday!!! Pot luck: Remember your treats! We're meeting in front of the Rocket shop at 6:15...please remember to bring your skates, home jerseys and helmets! Reminder to wear white jerseys on Monday to take thank-you card pic for sponsors! Reminder that there is a team builder at 5:30 tonight...upstairs at the APM centre. What a great start to the season. ALL girls played their positions amazingly well! Abby, Jessica, Sydney, and Madeline provided a strong defence, leading to strong offensive play by Emily, Alyssa, Alyssa, Lisa, Tait, Taylor and Rebecca! Congratulations to Rebecca on scoring the first goal of the season and Danielle for the great saves leading to a shutout! Tait followed up with 2 more goals in the third period! Well done everyone! What a team! We are having a team building session at the APM centre Thursday, November 11th at 5:30, upstairs APM centre. Pizza will be served. Please see your email for further details. NR Atom Girls 2010 "Rocket Snow Crew"